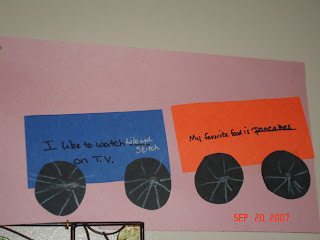 My friend Karen sent me these pictures today of her daughter's train she made at preschool. This is a great activity to go along with colors and shapes. 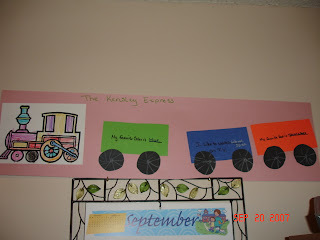 You can talk to your preschooler about the wheels of the train being made of circles and the train carts being made of rectanges. 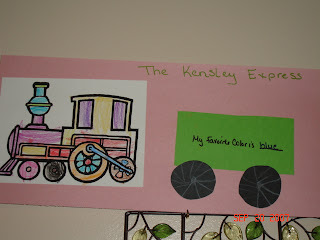 You can also discuss the colors of the train and the child gets to tell you their favorite color to complete the sentence. Of course, you should let your child assemble her train herself. You're welcome! Glad you like it. Here's a tip: Only let a few kids at a time come to the table to make theirs. I have found that having all of them at onceis just too much. I usually have 2-3 at the table at one time while the others are playing. Did You Ever See a Red Bird?